Brazilian financial markets fell in highly volatile trading on Thursday as investors feared former President Michel Temer’s arrest on graft charges could slow proposed pension reform seen as critical to injecting life into a tepid economic recovery. Temer, who left office on Jan. 1, is accused of leading a “criminal organization” that took in 1.8 billion reais ($472 million) in a bribery and kickback scheme related to the construction of a nuclear power complex. At one point on Thursday, the Bovespa stock market lost as much as 3.7 percent for the week, which would mark its worst week since August. Brazil’s 10-year bond yield was up more than 20 basis points at 8.93 percent and the currency, the real, down over 1 percent at one point. But markets clawed back some of these losses as the sharp moves prompted traders to book profits, reduce positions and assess what is next for the pension reform process. “Investors were already primed to sell Brazil and the uncertainty fueled by (Temer’s) arrest accelerated the move,” said one trader at a Sao Paulo brokerage. “But that gradually eased and when all is said and done, will the fiscal adjustment (from reforms) be enough? I think today’s caution was exaggerated,” he added. The Bovespa ended 1.34 percent lower at 96,729.08 points, Brazil’s 10-year bond yield closed up four basis points 8.76 percent and the currency ended little changed at 3.79 per dollar. Temer’s shock arrest came a day after the government unveiled a drastically watered down austerity plan for military pensions and pay, and a poll showed President Jair Bolsonaro’s popularity has plummeted. There is no direct link between Temer and the Bolsonaro government or its economic agenda. 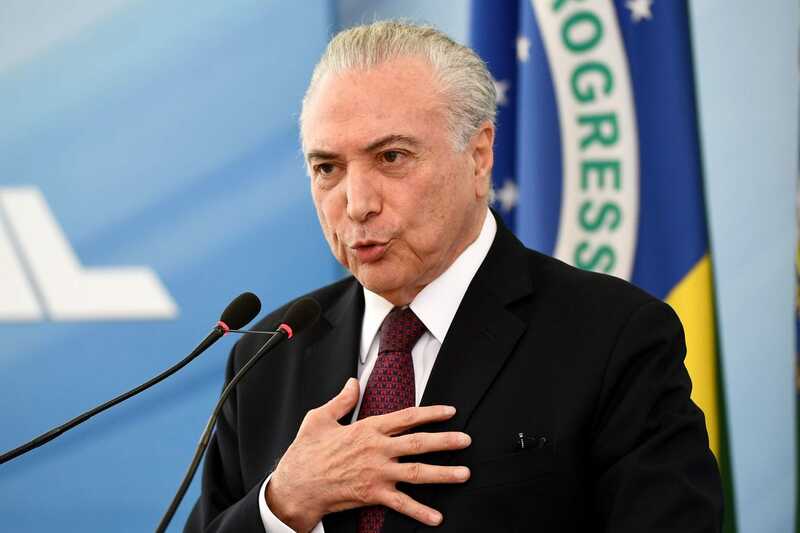 But pension reform is not going as smoothly as the government would like, and the scandal around Temer and his former aides is seen as an unwelcome distraction. Pension reform remains investors’ biggest worry. The 10.4 billion reais in savings from changes to military pensions and pay was well short of the 93 billion reais the government had originally trumpeted. This raises questions about how much the government will be forced to compromise with other sectors, diluting its savings target of over 1 trillion reais in a decade and slowing its passage. Recent surveys by Bank of America Merrill Lynch and Citi show investors growing more pessimistic on the eventual scale of savings and speed of the reform bill’s passage through Congress.